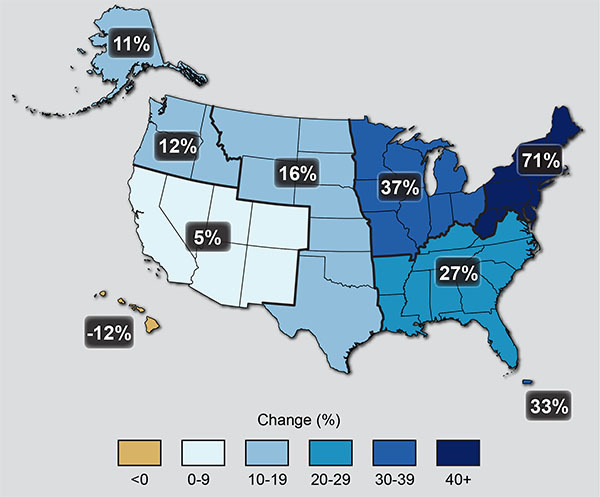 In the northeast U.S., there has been a 71% increase in the amount of precipitation falling in very heavy precipitation events from 1958-2012 (see map, citation and web link below from one source where this map is published, Climate Change Impacts in the United States: The Third National Climate Assessment report). A recent study of the frequency of larger storms and regional streamflow trends found that the 10-year flood from the period 1960-1990 became the 5-year flood during 1980-2011, and the 25-year flood from 1960-1990 became the 10-year flood for 1980-2011 (Matonse & Frei 2013, see graph and full citation below). Smaller storms have also become more frequent – in recent years, storms of 2 inches or more are occurring on average more than twice every year, up from an average of about once each year in 1950 (personal communication with Dr. Art DeGaetano, Cornell University, on August 18, 2014). The map shows percent increases in the amount of precipitation falling in very heavy events (defined as the heaviest 1% of all daily events) from 1958 to 2012 for each region of the continental United States. These trends are larger than natural variations for the Northeast, Midwest, Puerto Rico, Southeast, Great Plains, and Alaska. The trends are not larger than natural variations for the Southwest, Hawaii, and the Northwest. The changes shown in this figure are calculated from the beginning and end points of the trends for 1958 to 2012. (Figure source: updated from Karl et al. 20091). More details about this graphic and its source are available at this page. These and other analyses of precipitation trends by climatologists and other authorities indicate that our region is experiencing a significantly larger number of bigger rainstorms in recent decades as compared to 50-60 years ago. The total annual average precipitation – the amount of rain and snow we get each year — has gone up only slightly during this period. In other words, while we have not experienced a dramatic increase in the total amount of precipitation we get each year, on average, there has been a very marked change in the pattern of how this water comes. We are getting less rain coming in long, gradual storms (known by some as “farmer’s rain”), and more is coming in shorter, more intense storms. As a result, rain has less time to seep into the soil and groundwater, and more of the rain runs off quickly. This creates higher risks for soil erosion and localized flooding. It also reduces the amount of water that recharges our groundwater aquifers, because more runs off to streams that drain away more quickly. To be clear, all of the forgoing information refers only to changes that have already occurred – this is what has been measured in actual precipitation and stream flow observations. It is also important to consider the predicted changes that will occur in the next 50 years and beyond based on climate change studies, which indicate a strong likelihood that these patterns and changes will become even more pronounced. More of the precipitation will come in fewer, larger storms and we are expected to get somewhat more total annual precipitation in this part of the U.S. Notably, some engineering standards for sizing stormwater infrastructure, and the underlying data used for FEMA flood insurance maps, are based on historical data, not on more recent conditions. As we are in the midst of these changes in recent decades, the changes that have already occurred create new challenges for site and infrastructure design. Key questions for property owners, municipal officials involved in planning and development, and agencies involved in managing municipal infrastructure others is whether sizes and designs of existing and proposed culverts, retention ponds, and other stormwater infrastructure are based on relatively recent data on storm sizes and recurrence intervals. More broadly, areas that have not been at risk of flooding in the past may be at higher risk now than existing FEMA flood maps indicate, and these risks may increase even more in the future. These trends also have major implications for water supply planning and management of drinking water sources – increased erosion of sediment into water bodies will affect water quality in terms of turbidity and other issues, and reduced groundwater recharge may affect availability of water from wells.